A little bird told us that Kirstine Stewart has been appointed the managing director of Twitter Canada. She was the executive vice president of English services at Canadian Broadcasting Corporation. Her TV experience at CBC will undoubtedly benefit her stint at Twitter Canada. The news was first announced on Twitter and as soon as the news broke out, there were congratulatory messages pouring in from all over twitter. A few hours later Kristine had her name on the Twitter trends in Canada. Among other social media platforms we saw Brian Church take the lead role at LinkedIn Canada in 2011 while Jordan Banks took a similar position at Facebook Canada in 2010. In the same year, Google appointed Chris O’Neill as its managing director for Canada. How does Stewart stack up to the other social media managers in Canada? We thought we’d compare the leaders of these major brands based on their current social media footprint and see who has the biggest muscle in the digital world. Customized profile pictures and cover/header images on respective social media profiles. The amount of engagement they usually garner. How active they have been since the start of this year. Moreover, we have also provided the number of Twitter followers, Google Plus followers and Klout score data for you to see how effective they personally are on social media. We have not included LinkedIn because all of them have a complete profile and have done the same for Google Plus because some of them have put up strict privacy settings which block the general public from viewing any data. Jordan banks joined Facebook as the head of Canadian operations in 2010. We searched high and low, far and wide but guess what? We found that the head of Facebook Canada, does not have a public page on Facebook. He does have a normal profile page for his friends. Now that is very surprising especially since he has a profile on most other social media platforms like Twitter and LinkedIn. However, Jordan has a good presence on Twitter and has the second highest Klout score. “Home is where the heart is” A proverb that perfectly fits Chris O’Neill’s social presence. 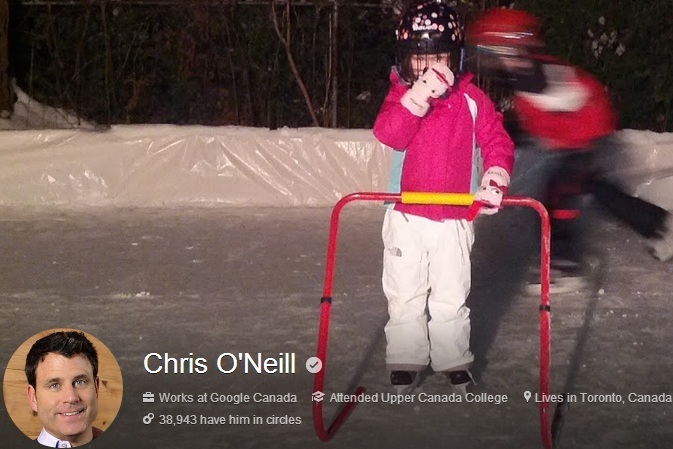 Chris has a massive following on Google Plus with over 38 thousand followers. He engages his followers pretty well, but then he has a relatively weaker presence on Twitter and an average Klout score. Not surprisingly, Brian Church has a good presence on LinkedIn like the others on this list. However, his presence on Twitter and Facebook is intermittent and is almost non existent on Google Plus which is why he scores 0.5 on recent activity. He also scores poorly on graphic presence because there are hardly any customized images besides his profile picture. She seems to be on the top of the game (at least on this list) when it comes to personal social media presence. She has 12,950 followers on Twitter and has the highest Klout score. She scores well on recent activity too especially since there have been a lot of people engaging with her since she became the Head of twitter in Canada. Who do you think is the most effective social media person among them?